The reason for my username. 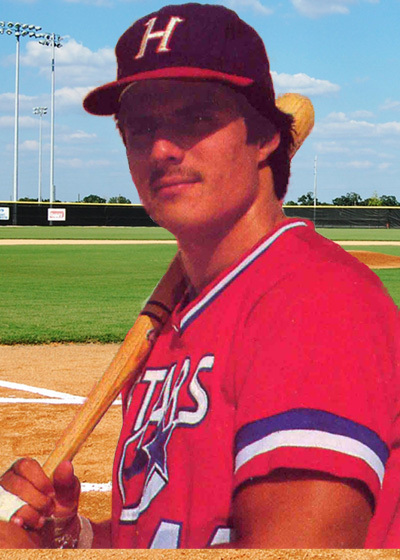 They were quite active with the minor league team the Huntsville Stars, and have had numerous signings with several of the players in the 80’s like Luis Polonia, Terry Steinbach and Mark McGwire. 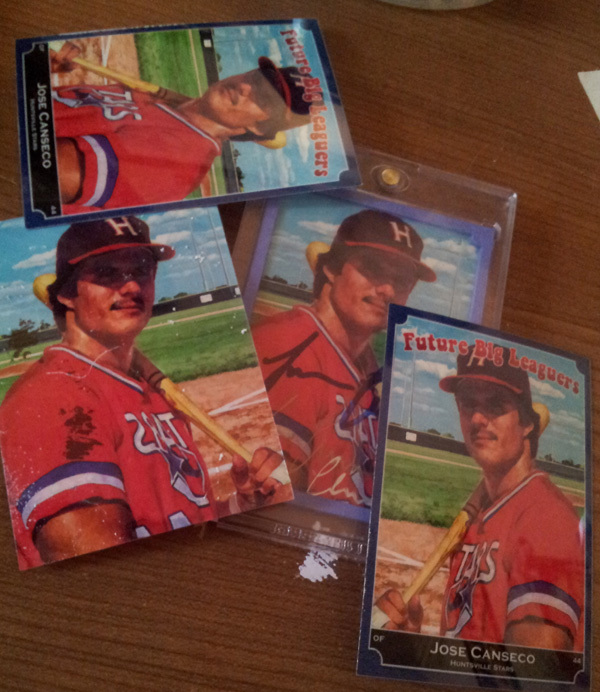 They even made baseball cards. The whole thing was mismanaged, because according to Beckett years ago, they actually produced the cards before getting the agreement! 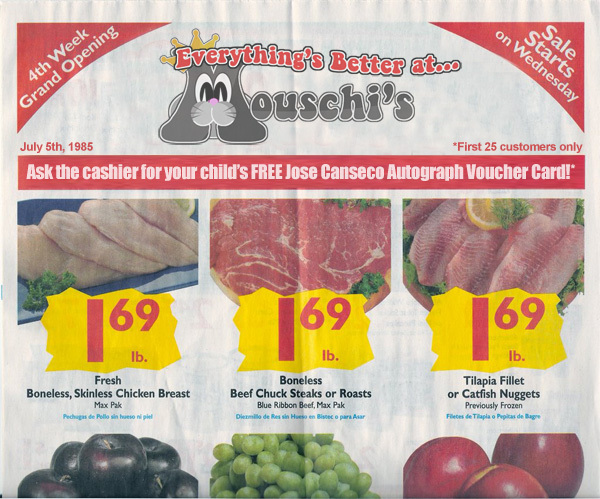 The idea was to bring the newspaper ad in, ask the cashier for the Canseco baseball card (limited to 25 copies). 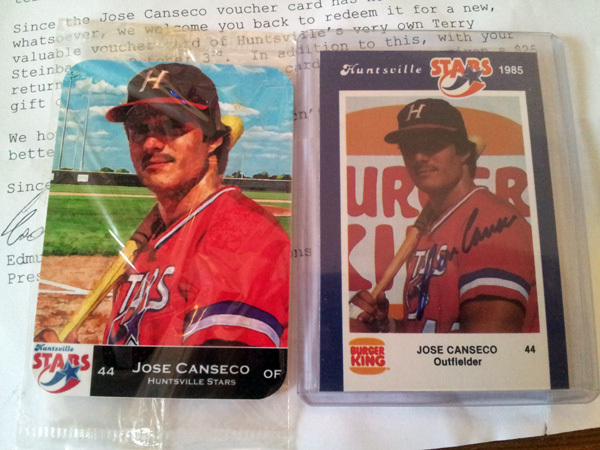 The card acted as a voucher that you could bring to be signed on September 2nd, 1985 at the store. 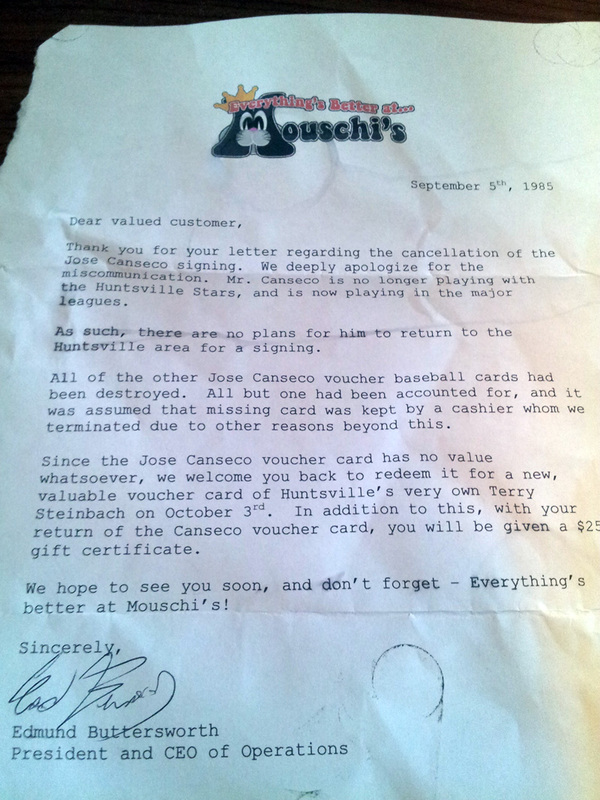 If you don’t want to read it, it basically says Jose ain’t comin’ back to Huntsville. He’s a star now. The other copies of the card have been destroyed (I HAVE A 1 OF 1!?!?!?!?!?) 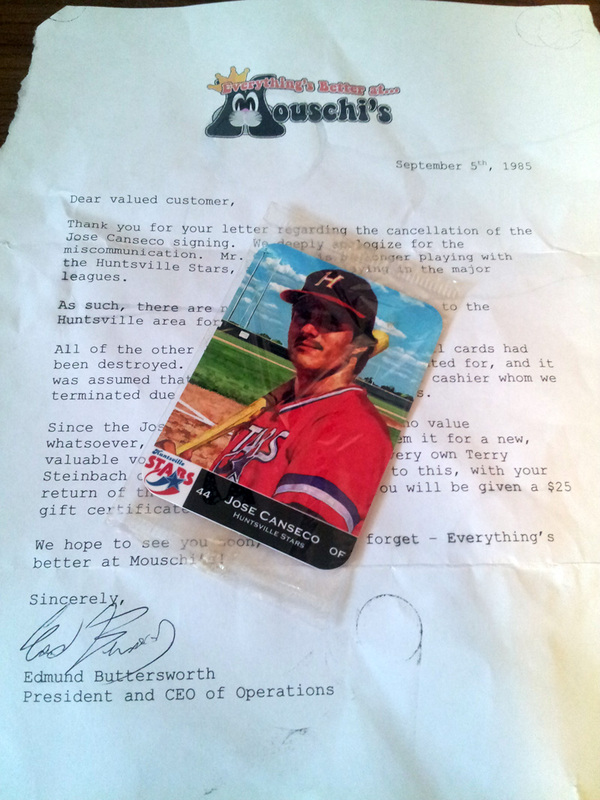 but you are welcome to bring the “worthless” card back for a “valuable” voucher of Terry Steinbach who will be signing. In addition to this, they would get a $25 gift certificate to the store. The previous owner noted that he snubbed them and didn’t want Steinbach. 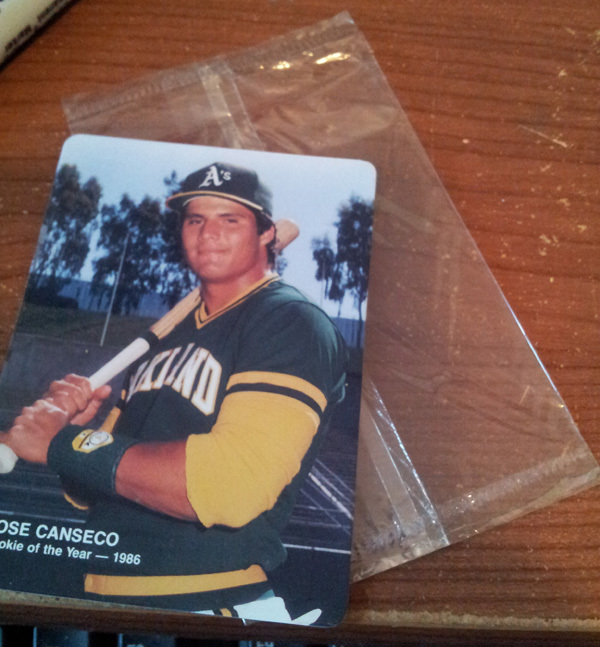 He wanted Canseco. He mentioned that it was bizarre that representatives from Mouschi’s would continually call him over a period of 3 months, even after the Steinbach signing to get the card back. They offered substantially more money for it, as well. This ultimately subsided, and they began getting disturbing calls and hang-ups at all hours of the night. Finally, it all ended. 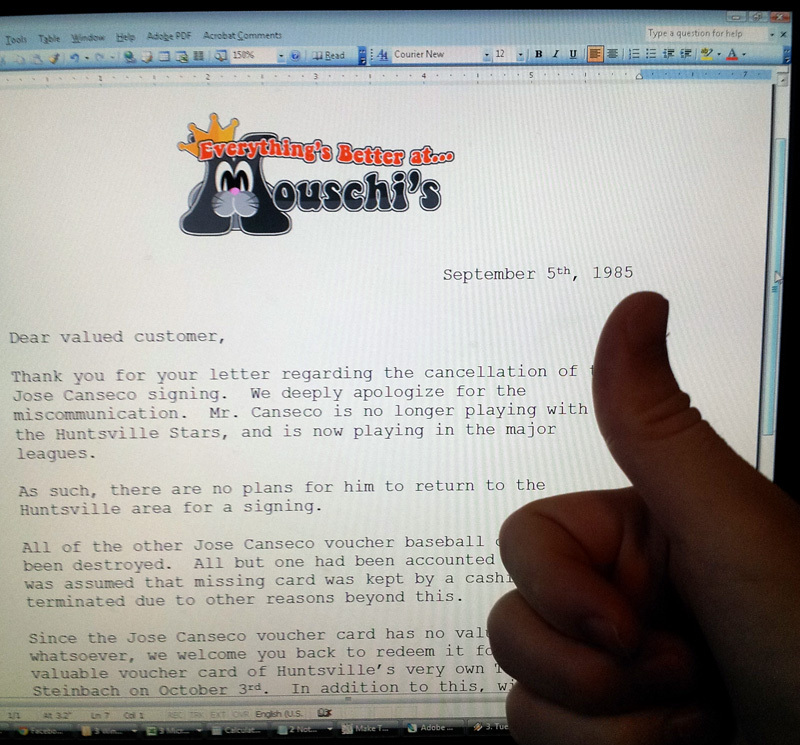 If you look at the letter he received, notice how Mr. Buttersworth (what a ridiculous name!) 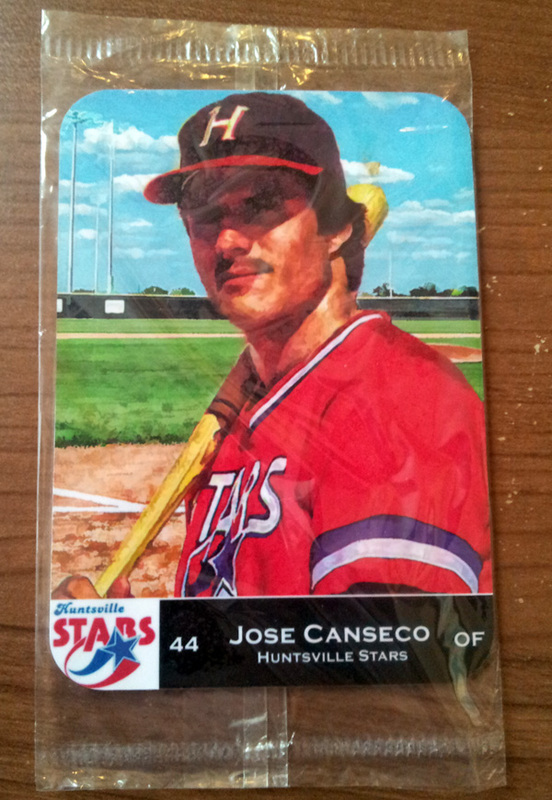 explicitly mentioned that the Canseco card has no value. The back story of this is that the whole chain went belly-up due to a legal altercation with Burger King. 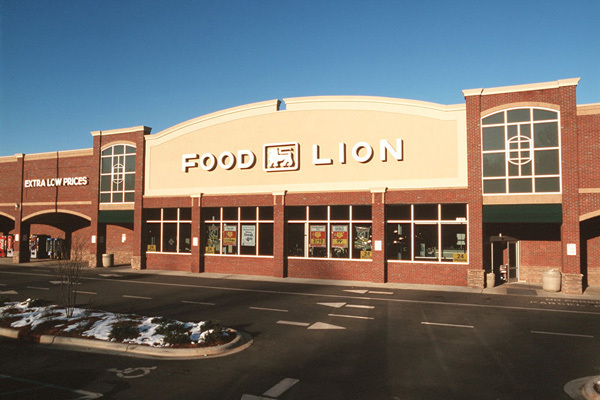 The fast food giant crushed the local grocery store chain, and it was no more. 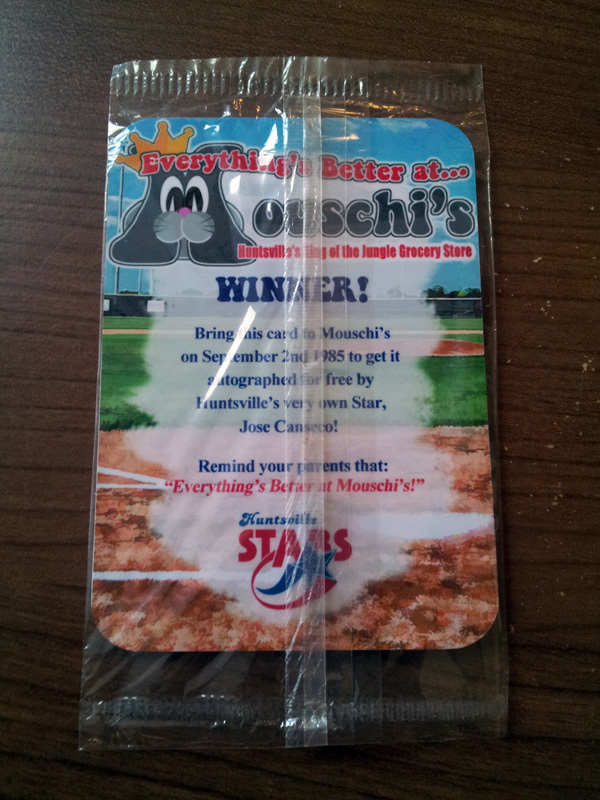 Why did Mouschi’s make such a concerted effort to get the only card in existence back? 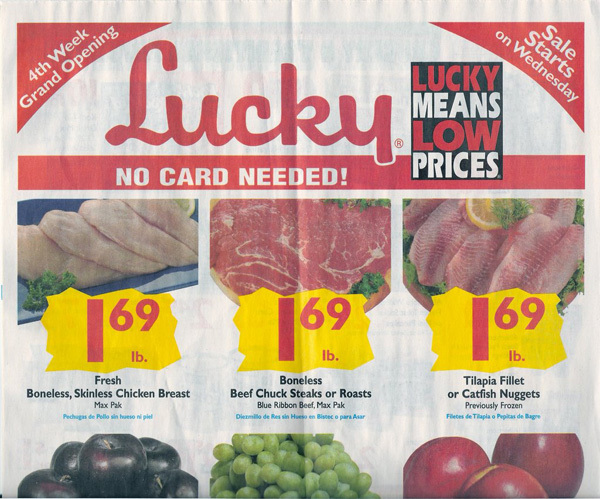 Could this card be the link to the downfall of the entire grocery chain? That is one theory, anyway. What if that whole thing was a hoax??? 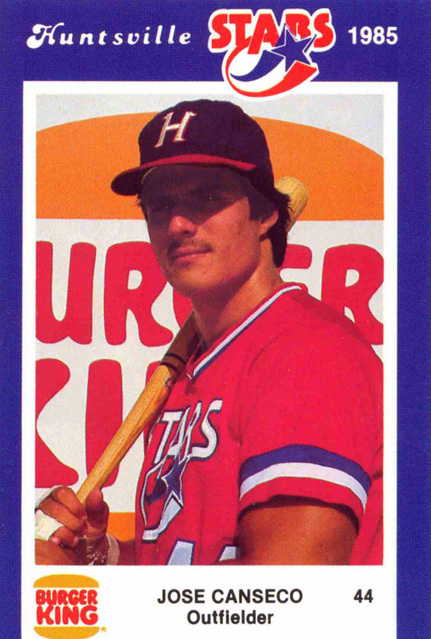 What if someone else had taken the Burger King card, and took out the logo in the background? What if they had just slapped Jose’s pic on the front of it? 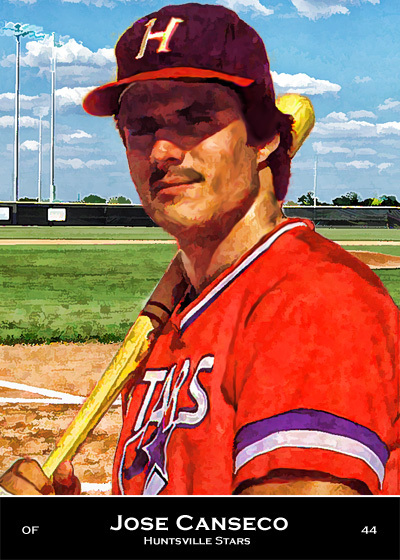 And made the background a painting along with putting a bottom graphic? And made Jose a painting as well? Was Mr. Buttersworth’s letter a real thing? Look at all the ink stains, wrinkles and rips. Heck, a real signature from ol’ Edmund himself. Or was it intentionally aged after being printed? What if that had been intentionally aged as well? 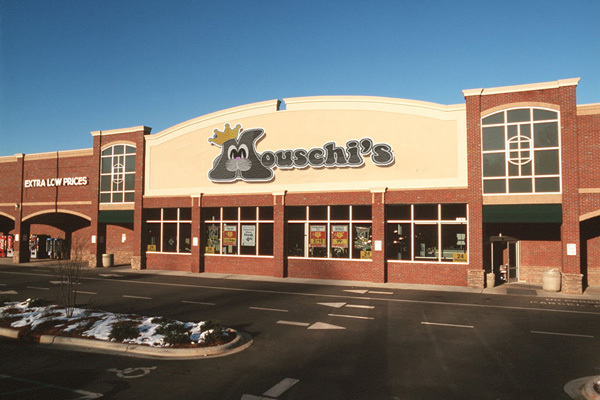 And if it weren’t a “Mouschi’s” at all? What if the logo was just made yesterday by some dude with too much time on his hands yesterday evening? Curious. Surely, no one would go through all this trouble of doing various copies, only to write up something that everyone else could enjoy! And even make a rounded corner version to mimic unlicensed 1980’s cards, while using a plastic baggie from a Mother’s Cookies card to give it an authentic look! 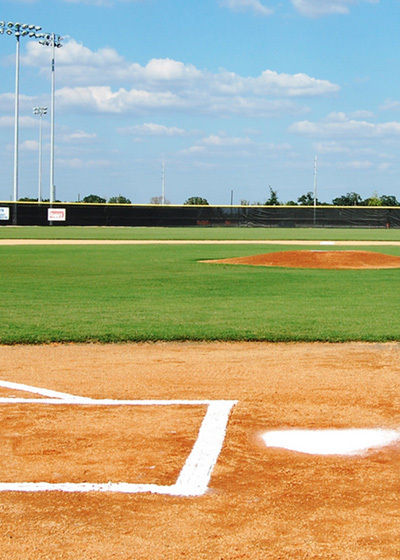 You have quite a gem there. Congrats.